The big headed ant earned its name because it has an abnormally large head compared to the rest of its body. Its color varies between reddish-brown to yellowish-brown and sometimes black. Their mandibles are quite large and are visible to the naked eye. The workers have two different groups; the majors, which are around 2 mm long, and the minors, which are between 3-4 mm long. The big headed ant is considered one of the worlds top 100 worst invasive species. Originating from the Indian Ocean Island of Mauritius, this ant can now be found all throughout Florida. The big headed ant prefers to nest inside dead tree stumps and logs if available. They will also build their nests under protective objects like rocks and flowerpots. Big headed ants like to create nests in the soil and build mounds on top of the earth, just like fire ants. When big headed ants are nesting in residential homes, they will nest under the foundation and enter the home through slight cracks. Once big headed ants have established a colony indoors, they will pile up dirt or debris around cracks in tiles, baseboards and other small openings. The big headed ants nesting debris often confuse homeowners who commonly mistake the dirt for subterranean termite mud tubes. In South Florida, mating season for the big headed ant is typically in the Spring and Winter months. Reproductive ants will grow wings and fly out of the colony in search of a new mate. Each colony can actually hold many fertile queens, each laying around 300 eggs per month. The average life span for the workers is around 40-80 days. 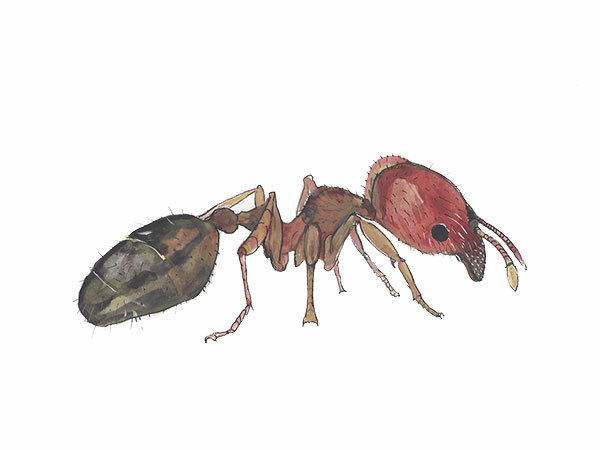 The big headed ant is omnivorous, consuming both plant and animal based foods. Big headed ants enjoy sweet nectars and honeydew. When sweet liquids are not available, big headed ants will consume dead insects and invertebrates. Foraging ants seeking food will trail in a line, which can be seen on the outside of structures or along vegetation such as tree limbs. Foragers alert others of new food sources and recruit in large numbers. If oversized insects are discovered while foraging, the big headed ants will dissect the prey and carry each piece back to the nest to feed the others. Residual spray products are effective when treating for big headed ants. Preventative treatments should be performed 6 times per year. Big headed ants are very common in lawns and flowerbeds and can be treated with granular insecticides. If the ant nest is difficult to locate indoors, use a sweet liquid ant bait or gel combined with a residual spray. If the nest is located in a tight area, use a dust or aerosol to inject the insecticide. Warning: Pesticide is poisonous and should be handled by a pest control professional. Always read the label and follow instructions before use. We are experts at solving ant problems. There is no problem that we havent seen in our 80 years of experience. Want to know how to get rid of ants and ant problems? Call or email us for a free inspection.